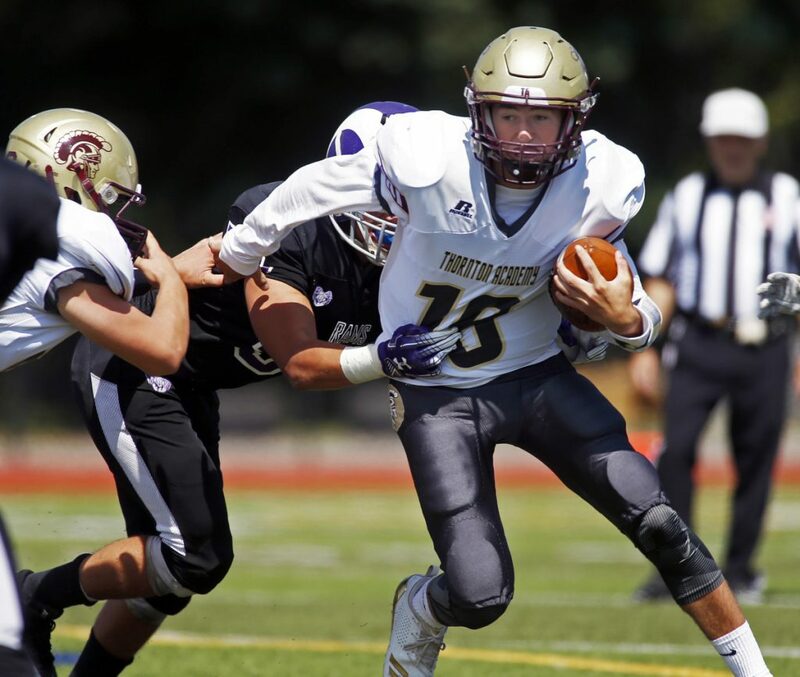 The Golden Trojans open their season with a 70-0 win, showing why they're among the favorites in Class A.
Thornton Academy put up plenty of points during its football season opener Saturday against Deering, and the Golden Trojans’ defense wasn’t too bad, either. The Trojans held Deering to just 6 yards, and the only first downs they allowed were on penalties as they cruised to a 70-0 win at Fitzpatrick Stadium. Gikas opened the scoring with a special-teams touchdown. After Thornton forced a three-and-out on Deering’s first possession, Gikas fielded a short punt, waited for his blockers and raced 32 yards to the end zone. Brady Forbes kicked the first of eight extra points to make it 7-0. Just three minutes later, sophomore Costa Gikas capped a five-play, 56-yard drive with a 5-yard touchdown run. Thornton’s defense set up the next touchdown, as Dan Tarbox picked off a Deering pass and returned it 27 yards to the 1. Grant Dow scored from there to push the lead to 21-0 with five minutes left in the first quarter. Athan Gikas secured an interception with 57 seconds left in the quarter, and Julien Bailey Cottle scored from 13 yards out on the first play of the second quarter to make it 28-0. The Trojans added three more touchdowns before the first half was over. Ean Patry found the end zone from 3 yards out, Cottle got his second TD with another 13-yard run, and Athan Gikas broke loose for a 39-yard run. Isaac Ofielu joined the touchdown parade early in the third quarter with an 8-yard run to make it 55-0. Even with Thornton’s reserves playing in the second half, the Trojans kept scoring. Michael Jordan broke free for a 40-yard TD run later in the third quarter, and Quinn McCollum scored the final touchdown midway through the fourth. Deering Coach Rob Susi challenged his team after the lopsided loss.